If you are fighting against fine lines and wrinkles that are prematurely aging your appearance, there are many options that can give you a youthful boost. But what is best for you - Botox® Cosmetic or dermal fillers like Juvederm? Often a combination of Botox and filler is needed to achieve the best results because these products can work in conjunction to address different issues. Botox® Cosmetic is one of the most familiar ways of smoothing out fine lines and wrinkles by causing facial muscles to relax temporarily. Here at The Dermatology Center, we perform a lot of Botox and we see that Botox can be an excellent solution for many clients. For instance, someone in their late 20's and 30's might choose Botox to help prevent wrinkles and enhance their complexion. 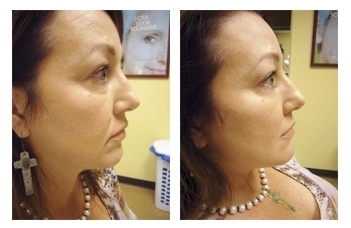 Older clients may opt for Botox to soften existing lines and prevent new ones from forming. Like Botox, dermal fillers are an injectable treatment used to tackle some of the most frustrating signs of aging. Unlike Botox, fillers do not relax facial muscles. Instead, fillers work to fill "creases" and "plump" the skin. This allows a more youthful looking appearance by replacing lost tissue volume with filler in addition to filling folds and wrinkles. The Dermatology Center offers popular fillers such as Juvederm, Juvederm Voluma™ XC, and Radiesse. Not sure which one is right for you? No problem, let our experts recommend the best combination of products to address your individual concerns. You can feel confident choosing The Dermatology Center for your beauty needs because we know natural-looking results are a must. One of our expert injectors will develop a personalized treatment plan based on their medical knowledge and injection experience. Contact The Dermatology Center today and regain your youthful appearance!